Good evening folks, I was away from home for three days over the weekend, and was kept very busy but with plenty of smiles thrown in. I travelled down to Thame on Friday, where the lovely Christina met me at the station and unburdened me of all my heavy bags before dropping me in the town itself. I spent a good few hours having a brisk walk round as well as a bit of shopping...of the window variety anyway! I then walked to my hotel and relaxed for the evening before my busy day on Saturday at A Maze of Memories. 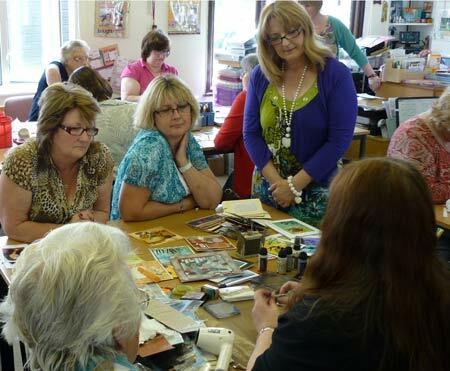 It was a fab day as I was demonstrating, as well as doing Make n Takes with all the ladies. Everyone was set to enjoy themselves. Here are Betty, Carol, Sue and Tina around my table and you can see some of the ladies making their cards. Christina, her staff and helpers were kept busy helping the ladies, keeping the kettle on the go and serving homemade cakes. 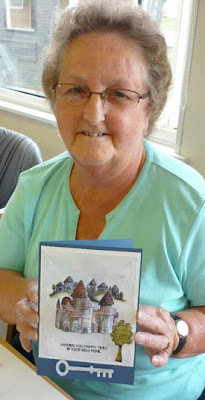 Everyone's cards were great and all were different from each other - here's Marilyn with her version using my I Dreamed of Castles, Laugh Often and Hoist the Flags stamp sets. Everyone who did the make n take got one of the stamp sets in their pack and were able to use more stamps and inks etc that were laid out on the tables. 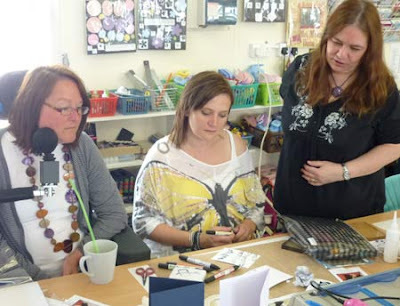 Here I am with Linda and Zoe, seeing how they are getting on...at this point they were trying out stamping and colouring onto gloss card. You can check out more pictures by going to www.amazeofmemories.com - which, for some reason is not coming up as a link on here...ggggrrr! Special mentions must be made of Diane and Susie J who presented me with a bag and told me that it was a gift for Thomas! Inside were some Whiskas treats and a set of two colourful catnip mice. It was so lovely of them and piccies of Thomas and one his new toys are further down. Aren't people kind? People who are fond of animals as well as crafting are probably the kindest. Thank you ladies, from me and Thomas! It was a really fun day all round and, as soon as we had tidied everything up it was time for me to set off to reading for my demonstration at Hobbycraft in Reading the following day. Normally I would have been making my way through London and the underground....a particular nightmare at weekends. However, with great generosity, Christina drove me there, so we were able to have a good chat about the day. We also saw some Red Kites soaring above us....first time I have seen one in "real life" so that was the icing on Saturday's cake! I had been looking forward to a quiet evening watching some tv, maybe a film, after a meal at the hotel, but, as it happened, I couldn't keep my eyes open, and was asleep before I knew it! Next day I was at Hobbycraft and met some new crafters as well as more experienced ones. Hello to Diane (yes, another one!) who hadn't known I would be there and gave me a big hug! Hope you had fun with the new ideas when you got home! Then it was a three and a half hour journey home. It was a packed train, but no yobbish behaviour I'm pleased to report. I was nodding off almost the whole way! When David picked me up from the station he said that Thomas had been out all night, no sign of him anywhere, but, as we drove in, there he was, telling us off quite vociferously! He had some of his new treats and then I gave him one of the catnip mice....... .....although he looks asleep, he just had his eyes closed in dreamy ecstacy and was tossing the little toy around and rubbing his face all over it. Thankyou Diane and Susie J....think this was a hit! Not sure if this counts for the Crafting Buddies blog as it is really meant to be about pets "helping" us to craft, but think Joanne will like these pics anyway! So, it's been a resting day today, except for catching up with emails etc. I'll be at Crafty By Nature in Kearsley on Saturday, and then at Dainty Supplies on Saturday, so hope to see you there if you live nearby. Hope everyone had a great weekend! Thanks ever so much for coming to AMOM Lindsay !! You are always full of fun inspiring ideas !! Thanks for the photos of Thomas enjoying his toys and so glad he likes them !! As you say...animal lovers and crafters ARE THE BEST !! I also wanted to say thanks so much for coming to AMOM. It was a fun if a little hectic day. Thanks for all your wonderful ideas - I've already 'borrowed' your rose card idea for a wedding card for my brother and his wife to be. Thomas looked like he liked his presents. It was a wonderful day on Saturday - thanks so much for coming to AMOM. Pleased Thomas enjoyed his toys - he really does look ecstatic. That weekend sounded a lot of fun. You know, I've never been to a make and take. Just going to see if I can get Thomas to appear on crafting buddies. Computer playing up just now.